So far this year the pharma industry has not been short of speculation on potential mergers between some of the world's biggest companies. The main story of interest has, of course, been Pfizer's failed bid for AstraZeneca, although Valeant's pursuit of Allergan and AbbVie's attempts to take over Shire have also been consistently in the headlines. Many of these deals have hit a brick wall, having struggled to suit both parties, but it's clear 2014 has already marked the return of interest in large acquisitions after a period of smaller deal-making with biotechs and academia. There have been previous times when industry thinking was that bigger is better and major deals have been commonplace, notably at the turn of the 21st century, when Glaxo Wellcome merged with SmithKline Beecham and Pfizer took over Pharmacia. But a similar spate of deals also occurred at the end of the 1980s and into the early 1990s, when SmithKline Beckman merged with Beecham and Johnson & Johnson purchased Belgian company Janssen. 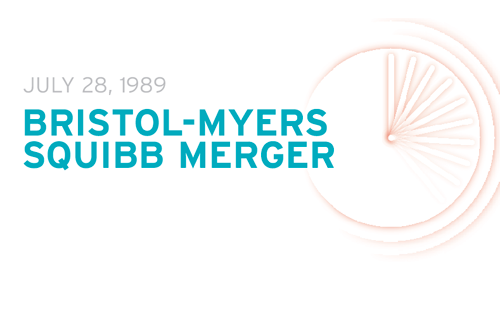 It was also in this particular period on July 28, 1989, that two US companies agreed to form what would become at the time the world's second biggest pharma company - Bristol-Myers Squibb (BMS). The stock-swap merger between Bristol-Myers and Squibb was worth $12bn and would create a company with total annual revenues of $8.6bn and pharma revenues of more than $4bn, trailing only fellow US firm Merck & Co. According to B Rajesh Kumar in his book Mega Mergers and Acquisitions: Case Studies from Key Industries, the merger was meant to “boost the competitive strength” of the individual companies, each of which had specific assets to contribute. For Squibb, many of its sales depended on Capoten (captopril), an ace inhibitor that dominated a pre-Lipitor/Crestor hypertension market. Bristol-Myers had a more varied portfolio, including a big-selling consumer goods portfolio, featuring drain cleaners and floor polish, as well as several prescription cancer treatments and a host of OTC medicines. News reports also hinted at patriotic reasons for the deal - an interesting point of view considering that UK-based Glaxo Holdings was also pondering a move for Squibb. According to the Chicago Tribune, a Bristol-Myers spokesperson said: “friendly unions are critical if the US pharmaceutical industry is to stay strong”. Indeed, both Bristol-Myers and Squibb boasted rich histories in the US dating back to the 19th century. In 1858 Edward Robinson Squibb founded the precursor to Squibb in a laboratory in Brooklyn, New York, having been unimpressed by the quality of medicines available on ships during the Mexican War. Squibb quickly built his firm's reputation, becoming the source of medicines for the Union Army during the Civil War and inventing the Squibb pannier - a compact wooden medicine chest used on the battlefield. It was only a couple of decades later in 1887 that Bristol-Myers formed when William McLaren Bristol and his friend, John Ripley Myers, invested $5,000 into the Clinton Pharmaceutical Company, a failing drug manufacturing firm also located in New York. The company remained Clinton until 1898 when the name changed to Bristol, Myers Company, although this only lasted a year until the comma was replaced by a hyphen following the death of Myers. Over the 20th century, Squibb and Bristol-Myers continued to develop their respective businesses as the modern pharma era came of age. Major developments for Squibb included antibiotics in the 1930s and 1940s, when it became the biggest producer of penicillin in the world. By contrast, Bristol-Myers' interests grew more diverse, even including a period in the 1970s when it took to Hollywood to form Palomar Pictures, producing films such as The Stepford Wives and The Taking of Pelham 1,2,3 and bulking up its household goods business. The merger in 1989 allowed the companies to consider their priorities, however, and BMS emerged with a new focus on healthcare and research. Crucial developments over the immediate years after the deal was completed include the launch of ovarian cancer drug Paraplatin (carboplatin) and Videx (didanosine) for HIV, as well as the acquisitions of manufacturer Union Pharmacologique Scientifique Appliquee. BMS also divested much of its consumer goods interests with the sale of the Drackett Company to SC Johnson & Son for $1.15bn. This deal included well-known products, such as Windex cleaner and Drano drain opener, allowing BMS to focus on developing its core prescription drugs business. It's a strategy that paid off and BMS has continued to be one of the leading global pharma companies, launching products such as antidepressant Abilify (aripiprazole) and diabetes standard Glucophage (metformin). Cancer seems to be where much of the future of BMS lies, however, including the fast growing Yervoy (ipilimumab) and the anti-PD1 drug nivolumab, which is set to make a huge impact when it hits the market.